ALL EVENTS HELD AT 33 HAWLEY ST, UNLESS OTHERWISE NOTED. Jil Crary-Ross will create a series of multi-dimensional paintings to explore the body as material and the role of movement in painting. Combining observation of the rehearsals and performances at Hawley with measurement of the artist's physicality, Crary-Ross will use the figure as a primary material to map and translate movement between dimensions, from action to object to plane. Paintings will include three-dimensional forms made of paper pulp and plaster bandage as well as two-dimensional works on paper/canvas that reflect gestures of performance and indicate the unseen body of the maker. THE ARCHITECTS (Improvisation Festival/Katherine Ferrier, Lisa Gonzales and Pamela Vail) This performance improvisation ensemble was born out of collaborations between Katherine Ferrier, Lisa Gonzales, Jennifer Kayle, and Pamela Vail, dating back to the late 1980s at Middlebury College. For over 20 years, the quartet has been engaged in celebrating composition through their commitment to collaborative movement research. The Architects have presented their work and taught master classes internationally; 2018 marked the thirteenth year they have held their summer intensive: MICI (Movement Intensive in Compositional Improvisation). 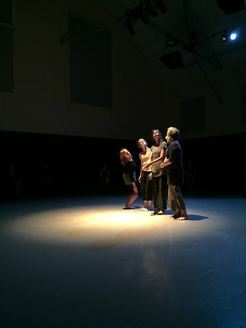 In their professional and life-long devotion to choreography, improvisation, and teaching, The Architects bring a holistic and ferocious intelligence to the dialogue of dance-making and teaching, process and product, individual voice and ensemble composition, crafting, and opening to the unknown. JENNIFER NUGENT + PAUL MATTESON (contemporary performance) have been presented by Danspace Project, Symphony Space, Dance Theater Workshop and most recently by the American Dance Festival. They both danced with the Bill T. Jones/Arnie Zane Dance Company and David Dorfman Dance and have each worked with many inspiring choreographers and dancing visionaries. They have taught at numerous festivals, colleges, and universities. Jennifer is currently on faculty at Sarah Lawrence College and regularly teaches at Gibney Studios and through Movement Research. Paul is full-time faculty at The University of the Arts in Philadelphia. JIL CRARY-ROSS is a New York City-based painter. Crary-Ross explores the relationship between identity, land and the built environment. Their studio practice, ST. PULP, is a collection of New Americana that includes contemporary portraiture, abstract surface study, and fluid pulp forms. Recently, Crary-Ross has exhibited work in New York City and Massachusetts. Jil also publishes a zine, Sharkbite, and consults at A.P.E. Gallery in Northampton, MA.